Parenting post separation is undoubtedly a challenge. Physically sharing your children with someone who makes you feel angry, distrustful or impossibly hurt is incredibly difficult. However, in most cases, people can see the importance of their children having a positive and loving relationship with both of their parents and are prepared, with advice and support to work through some very tough emotions to ensure their children cope as well as possible with the changes to their family. Those of us who specialise in long running and complex children disputes deal with those parents who cannot see any benefit to their children maintaining a relationship with the other parent after separation. These parents are said to be ‘implacably hostile’ to the relationship or actively alienating a child from the other parent. In reality, this means that one parent will go to any lengths to prevent or undermine a child’s relationship with the other parent. The reasons for implacably hostility are many. It can be control, revenge or even, fear. It can be difficult to make the distinction between bad partner and bad parent. Often the continuing contact (however minimal) caused by co parenting post separation can just be too painful and parental wishes and feelings override a child’s needs. In many cases, the hostile parent will genuinely believe a child would be better off with no relationship with the other parent. So how best to deal with cases where it is either clear or suspected that a parent is undermining a child’s relationship? It is tricky as often in these cases a child’s need to have a meaningful relationship with both parents will be in direct conflict with his or her expressed wishes and feelings which have been influenced by the hostile parent. It is essential not just to tackle the hostile parent’s behaviour but to support the child and promote a relationship with both parents without causing further trauma or distress. 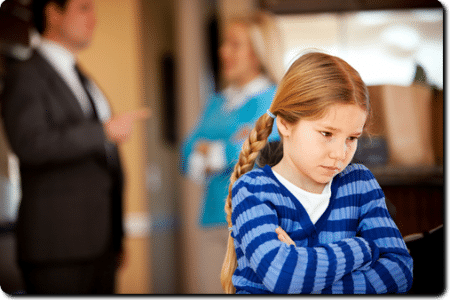 As family lawyers we tend to dread the Court coming to a conclusion that, however wrong is it a child has been manipulated, forcing contact on a child who does not want it will cause more harm than good. Involve professionals as soon as possible – whether this is separate representation for a child, support for the child and parents via a befriending or family assistance type order, involving an independent social worker to support contact and report if CAFCASS or Social Services involvement will lead to delay and, if there is evidence that a child is traumatised, obtain a psychiatric report which can not only consider whether parental alienation is a factor but provide practical guidance on how best to support the child whilst the relationship is reinstated. Even if one parent is found to be implacable hostile to a child having a relationship with the other parent, it can be complex to remedy. Committal to prison for repeated breaches of a child arrangements order is rarely in the interest of a child and therefore very unlikely. The Court can order that a living arrangements order is transferred so a child lives with the other parent but this is not always appropriate or possible. The reported case of Re O (A Child) (Fact Finding) in which I was instructed by the father produced findings that mother’s inability to support the child’s relationship with father (a) amounted to significant emotional harm and (b) that the s31 threshold criteria was met. Therefore, mother was given a very clear message by the Court that, if she did not change her behaviour and support the relationship between father and child, the full range of the Court’s powers would be considered and that these extended to public law care and supervision orders as well as the remedies above. With much political discussion at present about what constitutes ‘emotional abuse’, it is interesting to consider that the Court will accept that an inability or unwillingness to promote a relationship with the other parent can and will cause a child significant emotional harm to the extent that the s31 threshold criteria for care orders is met. And as Fathers’ and Single Parents’ groups push hard for its inclusion as emotional abuse in legislation, could we see the time when a parent who systematically alienates a child from his or her other parent is guilty of a criminal offence? Thanks for this article. I’ve been seperated from my ex for 8 years and it’s been a real battle to keep my relationship with my sons alive. Unfortunately my eldest (15) has fallen by the wayside and has not contacted me for nearly 2 years (heavily influenced by our situatiuon). I managed to get a contact order for my youngest (11) but Mum has done her utmost to alienate me from them. Whats really sad is that I’m a good Dad, hands on since day 1, I pay my child support and I make time for my kids and give them experiences and support their education. My ex simply refuses to communicate on any level and completely undermines my role as Dad which in turn confuses my boys and creates a difficult environment.. Very upsetting and frustrating. I’ve been to Court 3 times and I find the whole system very heavily weighted towards the ‘resident’ parent, the attitude of my judge (same one on all occassions) was very much ‘Grow up and learn to communicate’ which i understand and agree with but it doesn’t really help and if anything reinforces my Ex’s stance as she simply ignores this advice every time. My daughter even wrote a article in a magazine based on lie, claiming they rang her,and it got out of control, so for all the article is a good read, it’s dose not have seamed to have done nothing in my case which is ongoing and listed for final hearing,after my daughters mother has made no effort to help in anyway and a quote from one report when my daughter was 3 ” my mommy said my daddy don’t not love me” and casscaff don’t see this as child alanation so what is it? I think the title “Implacable Hostility” is misleading. Parental Alienation is the correct term for what it is a form of child abuse. Working with Dads for several years I am struck how often social workers fail to even look for, let alone recognise the signs of, usually a mother, alienating the children. The use of false and exaggerated allegations, denigrating the other parent and isolating the child are all awful yet rarely are these behaviours recognised or taken seriously. It’s about time, for the sake the children this starts to be addressed. The term “implacable hostility” has generally been more widely used in the Court system although as the system (slowly as ever) comes to grips with the idea that an implacably hostile parent may actively or subtly alienate a child from the other parent the term “parental alienation” is gaining traction which is a good thing. If we name it, we can recognise it and try to deal with it. The case law is also quietly encouraging with the Children Act being looked at properly: the word used about children’s wishes and feelings is “ascertainable” and not “expressed” which is very helpful in cases where children are being alienated as they often voice a parent’s view as their own. Understandably, there is a tension here as an integral part of the role of CAFCASS is to ensure children’s voices are heard (which is perhaps the easier part) but also to ensure decisions are made in their best interests (i.e. looking beyond expressed views and being alive to these more complex issues). Parental alienation should be recognised, acknowledged as a crime and punished accordingly. Men have feelings and so do our children. I have a shared care child arrangements order specifying times, holidays etc and my children’s dad has been on a 6 month campaign of brainwashing our children (just turned15 &12;, one with special needs) doing things like collecting them from my parents during my parent time alluding to them being ‘distressed’ as their mum was out of the country on hol with their partner to encouraging both children to disappear off to his house without telling me encouraging secrecy ‘don’t tell mum’ changing their mobile nos without telling me and not answering his phone, to constantly whatsapping them before school, during school and after and his partner referring to herself as mum to our children and dad doing the same. My youngest is now too ‘scared to see me’. Where’s that come from? How is this not parental alienation? Their dad is v hostile, he has filed 4 court applications in 2 years and ignores all legal advice. I am currently awaiting attendance at court to enforce order as I’ve had no contact with my younger child for over 2 months despite living less than 2 miles away from their dad and having a very loving and close relationship all his life as I have been the main carer as I gave up my career to be at home. Incidentally everything was ok until I introduced a new partner despite their dad leaving me for his current partner 3 years ago and living together ever since? I am tired of our children being used as weapons when they have a fundamental right to love and be loved by both parents. This all sounds really sad for you and the children. You mention you have a court date when hopefully contact will be restored. We wish you well and hope for the sake of your children a resolution is found quickly. Thanks for articulating what is currently going on for me. I am currently going through the courts to get meaningful contact with my kids and just trying to get my solicitor and barrister seems to be a chore to even get them to recognise the signs from my ex. Every and any chance she gets she undermines me and tries to get the children to go against the order. The amount of times I have heard from them ’ I don’t have to do what the courts says if I don’t want to’ from them is worrying as they are only 10 and 8 and seem to think there is this faceless ‘court’ thing telling them what to do. It is really not in their best interest to get caught up in the legalease as it is too far out of their understanding and the strain on them is massive. Thanks for your comment. Such cases are, sadly, ones where is almost impossible to keep the legal proceedings away from children as they are often highly involved in (and the mouthpiece for) adult thoughts, feelings and issues. The use of children orders I believe is a very effective way of giving children appropriate information about the Court process. A child friendly synopsis of what is happening and why (often communicated to the child via a 3rd party) can prevent the child receiving frightening, skewed or alienating information about what is happening from a parent. It also allows them to know that they are not being ignored. I appreciate the information you have posted and it is absolutely pertinent to my situation. Thank you from my heart .My first hearing is next week and i have undertaken a mountain of work in preparing my case for what may be a extremely difficult case. I never would have believed fathers had no rights until my ex partner and I were separated although so far i have no complaints about Caffcass and the courts that have been really efficient in progressing my case to court. I am anxious that the court orders i seek have no or little consequence if my ex partner does not adhere and continues to prevent access based on 1000 hrs+ of research. This is what makes the s31 threshold criteria for care orders relevant when there is clear evidence of implacable hostility.I may not be successful but will try my best. My advice is one day at a time and keep trying to other dads. Hopefully the case precedents will be in favour of the child having contact with both parents as soon as possible. My daughter has just filed an Enforcement order because her ex partner takes their son out of school without permission, refuses to speak to her or is very abusive towards her. Their son lives with my daughter and there is a Child Arrangement order in place, although regularly broken by hI’m not returning their son on time. Her ex takes pleasure in alienating their son from his mother, verbally abusing her to their son and causing a rift between mother and child. The latest thing is him booking a holiday for himself, new partner and his son during the same week as my daughter has already booked 5 days away with their son and his best friend. The father is demanding his sons passport, threatening to withhold maintenance, screaming at her in the street in front of their son and saying he will have her put in prison – all this in front of an 11 year old. She has been under the care of her doctor for 6 months with anxiety, depression and stress. We are waiting for a date for the hearing, but if it is justices again, they just want the easiest settlement and last time she was encouraged (pressured) to agree with the order. When she asked what she could do if the order was broken again, she was told to have a forward-looking attitude, and hope for the best! She has been advised that she may be suitable for legal aid, as her ex’s behaviour amounts to domestic abuse. She has applied for this with a supporting letter from her doctor. She is in no fit state to represent herself against this bullying, and sees her relationship with her son deteriorating every time he sees his dad. It’s not always the dad that looses out. Parental alienation is not specific to mums or dads. I have had experience of alienating mums and alienating dads and the consequences for the children involved are equally damaging and take such a painstaking long time to resolve. These cases need careful preparation, time and expertise. They are not going to be resolved outside of Court for a multitude of reasons. Unfortunately, the lack of public funding, gatekeeping and emphasis on out of Court resolution mean that it is difficult to get the issues taken seriously until they are causing real harm. As lawyers we keep highlighting warning signs and raising awareness and I do feel there is now a willingness to recognise this is a real issue. But Courts making orders that essentially appeal to people’s better nature to work is a major problem when dealing with these matters, I acknowledge. We submitted a carefully worded application and a C1A citing emotional and pyschological abuse, with evidence from a Family Worker of alienating behaviour, plus evidence of false allegations. Bullied by Cafcass for 5 hours at first hearing who tarred both parents with the same brush for not getting on and communicating. Cafcass decision enabled the alienation even more – can’t wait till final hearing and hope a Judge sees through it all. I think, deep down people like Cafcass enable it because the idea of a Mother having a child taken away is unthinkable. Better no Mother than an abusive one though. Often, sadly, it does take a final hearing to get to the bottom of false allegations and its not an easy process to stick it out until then – especially when it feels like the process itself is entrenching an abusive status quo. Practically a final hearing is often the only point at which the issues can be determined and change effected. There is a growing awareness that parental alienation isn’t just warring parents but I agree CAFCASS cannot just make recommendations and the Court cannot just make orders on the basis ‘people should get on/do the right thing’. They don’t and if they have asked for assistance they should get it or children will suffer. PA/S and implacably hostile we found not admissible by a higher court and expert reiew panel in Case Re L et al and this is the basis of PD12J. This theory is discredited and traps mothers and children into a catch 22. If they talk about abuse its a ‘proof’ of PA/S and IH. Many children are being forced into unsafe contact or residence with abusers. They have to put up with abuse because no one will listen to them or their mother, who left her abuser to be safe and found family courts have false beliefs about abuse. Ofcourse, PA/S/IH are a dream tactic for lawyers defending abusive personalities.. It is in my view positive that CAFCASS and senior judges are looking proactively about how to address parental alienation AND that we have clear direction as to how to deal with child arrangements where there are allegations of abuse. There is a clear distinction between the rejection of a good enough parent and justifiable estrangement from an abusive parent. The reasons for this, whichever is the case, should be assessed as early as possible with fact finding taking place if necessary so that children can be protected from the harm parental alienation AND domestic abuse can cause. I don’t think anyone dealing with a true case of parental alienation would consider it anything other than a slow and painful uphill struggle. Certainly not a tactic, never mind a dream one. Lawyers do however have a responsibility to make sure clients (and the general public) have a real sense of what parental alienation actually is. It is not something to be bandied around lightly in children disputes. This was a useful article to read. I speak from a different perspective. I never stopped contact with my child’s dad. I sympathise with parents (both mums and dads) where this truly happens – I help advice both. Indeed contact was welcomed – time for a break. My situation, there was a very unnecessary court order in place – which was undisturbed for 2 years (my child would cry when leaving – bed wetting and cold sores). After my child made allegations of abuse by the non-resident parent I stopped contact immediately and contacted Children’s Services for advice. To cut a very long story short – I have been left with huge financial burden, there were threats of resident change all within a family court. I spent 4 years defending – what turned around to be ‘my trial’ against allegations that I ‘brainwashed’ my child and alienated the relationship. I feel guilt that my child was so desperately unhappy, they felt compelled to make the allegation – (which they still stand by). Whether protest or truth, I have to live with the fact that there is no loving relationship with the biological father. There are no two lots of holidays, two lots of presents, two lots of love. Not all cases are the mothers fault – sometimes there are underlying reasons why a child does not want to see the other parent – and that’s usually down to the way ‘they’ are being treated, or the loyalty they have when they hear negativity towards the other parent. Thankfully said child is happy, well balanced and has freedom to speak out – even if they change their mind about seeing the other parent. I will just end on this ponder… why would a parent wish to pursue contact when such allegations were clearly made by the child? I’d run a mile. My two daughters are still subjects of Family Court proceedings since April 2008 (it’s now Feb 2018) and I whilst I’ve had success with obtaining shared residence Orders I continue to find CAFCASS, Social Services and the Courts are focused mainly on managing the number of cases they deal with rather than the individual children in those cases hence we currently have about six case numbers as the courts claim a case is resolved when nothing has been done to prevent or deter the alienation or the emotional harm. I would hope a database of case numbers could be created and in future a class action commenced for compensation for the children who are suffering ‘Emotional Harm’ because the courts are not dealing the the root of the problem. You say that forcing a child to have contact is likely to make things worse. I was wondering what your thoughts are in respect of going to court for contact for a child who is 14 years old. I am an alienated mother and have not seen my daughter for 6 months. She is stating she does not want to have any contact with me. There are some false allegations against me but nothing serious…… My ex is highly controlling and we have tried child centered mediation but this has failed. My solicitor has stated that as she is 14, I do not have a very good chance in court. I am also keen to put her needs first and worry that going to court will cause her more stress which i am keen to avoid given that she is now under a lot of pressure at school. However, i worry that she is being emotionally harmed by not having contact with her mother with whom she previously had a close and loving relationship with. I am also concerned about the long term damage that this will cause. I fear that she will remain alienated for a number of years. I have experience of the torment, anxiety and often guilt that a parent can feel when a child’s relationship fails to thrive with the other parent. Allegations must always be looked at seriously and reasons for refusing to spend time with a parent carefully examined. Automatically focusing on the parent (with allegations of alienation) rather than looking at what the child is thinking and feeling and needing creates as big a problem as pretending there is no such thing as alienation. The downside of increasingly knowledge is that there is a temptation to see it everywhere but every case must be examined properly to ensure children’s best interests prevail and, as also noted, resources often do not adequately allow these enquiries and assessments and many people have to navigate these difficult issues without the support and advice of experienced family lawyers. Paul that is a mind boggling statistic! My own personal opinion is that more orders are varied than enforced (although my own experience would actually indicate a higher % than the actual reality!) Two possible factors spring to mind: drafting of orders which are not ‘tight’ enough and allow for different interpretations which are dealt with by further definition and the benefit of the doubt not enforcement AND the focus of the Court is on getting arrangements for children working so being prepared to try new things to see if they work rather than making things that aren’t working work by enforcing. (The problem with the latter of course is that if there isn’t a ‘real’ reason why arrangements aren’t working, every new idea will fall foul of the parent who doesn’t want them to work. In those cases, enforcement is the ONLY option but parents need to have stamina to keep bringing breaches of order back to court and that is a tall order.